EVERYTHING YOU NEED TO KNOW ABOUT LASER TATTOO REMOVAL! The first and most important part of the procedure is the Initial Tattoo Removal Consultation with a Brazilian Beauty Professional Skin Therapist. 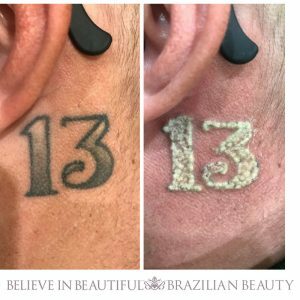 In a Permanent Laser Tattoo Removal consultation, we explain how the treatment works, what is important to know before and after the treatment and determine an estimate of the number of sessions required to remove the tattoo. The consultation will usually take around 20 minutes and is then followed by a test patch. The test patch is performed on a small section of the tattoo to see how the skin and tattoo respond to the laser treatment. Once we determine your skin has responded well to the laser, we can go ahead with your first tattoo removal laser session. Depending on the size of the tattoo, it can take 10 to 30 minutes for the treatment to be performed. After the completion of the laser tattoo removal treatment, we will cover the tattoo before you leave, recommending you leave it covered for 24 hours. When removing a tattoo, we are using the laser to shatter the ink into smaller pieces so that your lymphatic system can remove the ink. It is common to get some pinpoint bleeding, inflammation, heat and blistering in the area. We look for white frosting on the skin to ensure we treat the full tattoo area to be removed. This frosting is merely water vapour and lasts about 20 minutes before disappearing. It Is very important to keep the tattoo covered to prevent any risk of infection. 3- What about the pain? 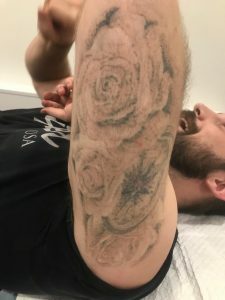 Laser Tattoo Removal is not a completely painless treatment, however, it is extremely quick and clients are more than welcome to use an anaesthetic to numb the area. We recommend speaking with one of our Brazilian Beauty Professional Therapists during your initial consultation about pain management. It is important to note that anaesthetic does not always remove any sensation because the laser will penetrate quite deep into the skin. Ice packs can also be applied throughout the treatment to help with any pain or discomfort. 4- How many visits are required? the overall health of the client receiving the treatment. 5- What laser/machine is used to remove the tattoo? At Brazilian Beauty, we use a Q-switch Nd: YAG Laser. It is a non-invasive laser that creates high-intensity pulsed beam light which removes black, dark blue, green and red ink with all other colours showing some degree of fading or removal. It targets ink in all skin types. All consultations are complimentary. “I got my tattoo done about 5 years ago at the age of 18 without considering If it was something I would like to have forever. 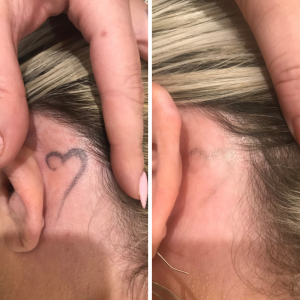 With my wedding coming up at the end of this year I couldn’t help but think about how I didn’t want it showing in my wedding photos so I started the laser treatment for tattoo removal process in August 2018. From treating other clients tattoo’s, I had a fair idea of what to expect. The laser itself feels like a rubber band flicking on the skin which does cause heat in the skin. During the treatment itself, it wasn’t too painful, and it wasn’t until after the treatment finished, I started to really feel the heat in the area and I also had some swelling. Once I had taken my protective bandage off the next morning I noticed it had a few small blisters in the area so I kept it covered for 2 days until the blistering disappeared. I had quite a few spots of pinpoint bleeding which disappeared after about a week. I have just completed my 3rd session and notice each time I get a treatment that the recovery time is reduced. 1-Right after the treatment, pinpoint bleeding and overall frosting after the laser treatment for tattoo removal. 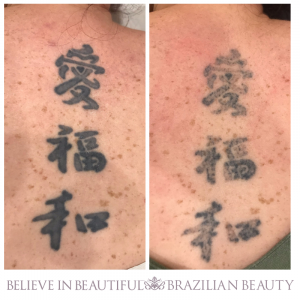 Book your Laser Tattoo Removal first consultation NOW in your closest Brazilian Beauty Clinic!